A Safe and Healthy Way to Increase Your OVERALL Energy, Focus and Performance! I was skeptical. I am pleasantly surprised. This works like a charm and does not make me jittery or have the crash feeling. One day I took 1 around 3:30pm, big mistake. I was up all night. Now I take 1 around 8 or 9am, and no problems going to sleep at 10. I will reorder, and I highly recommend! 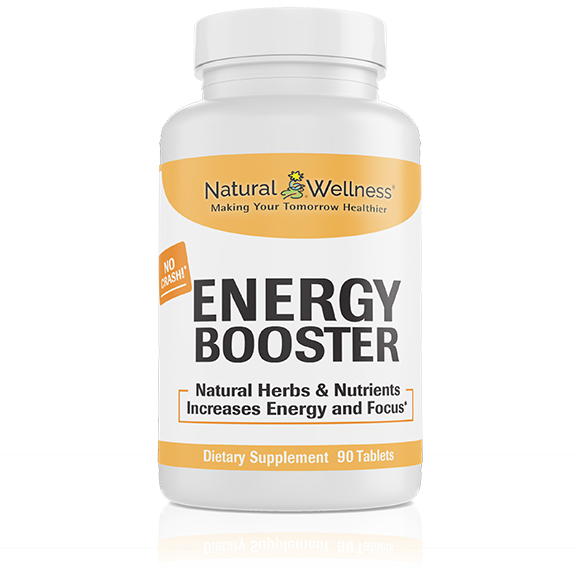 Energy Booster provides you with a natural boost of energy, increased alertness and improved focus that will last for hours without any bad taste or unhealthy sugar crashes. The key ingredients in Energy Booster are available in everyday foods, such as fish, meat, broccoli, avocados, bananas, and apples, as well as nutrients naturally produced in your body, thus making it safe for you to take every day. It contains zero artificial flavors or sweeteners, and only 75 grams of caffeine – less caffeine than in a cup of regular coffee. How Does Energy Booster Work? Maximize the strength and output of your cells' mitochondria – Known as the "cells' powerhouse," the mitochondria are responsible for producing the majority of your energy through the conversion of food into usable energy. Raise your metabolic rate – Metabolic rate is the speed at which chemical reactions occur in your body. Since chemical reactions are required to make energy, raising your metabolic rate is scientifically proven to increase your energy levels. Protect your cells from damage – Destroy free radicals that damage your cells and hinder their energy production. Strengthen your immune system – A depressed immune system can drain your body of energy and cause you to tire more quickly. 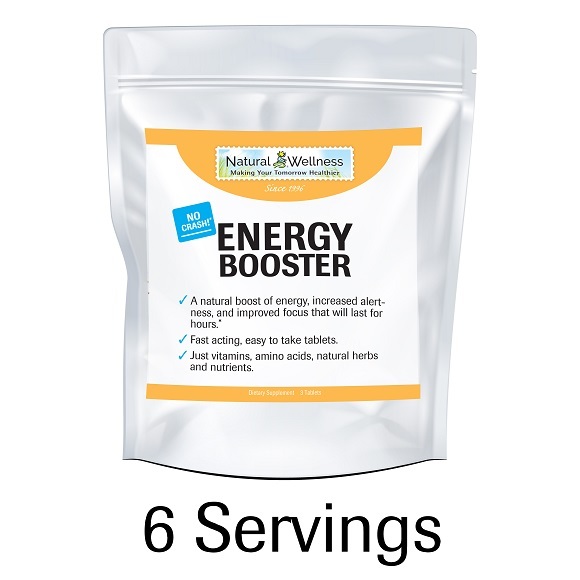 Energy Booster contains all natural vitamins, amino acids and herbs to increase your energy and endurance, packing all four energy-boosting strategies in each tablet. What Are the Best Times to Take Energy Booster? When You Wake Up: Not a morning person? Do you have trouble getting yourself up and moving? Try waking up with Energy Booster. In no time you'll feel alert, energized and ready to tackle the day. After Lunch: Tired of that post-lunch slump? Well, it's not a myth and you're not alone. In a recent study of 2,000 workers, they pinpointed the actual time to be 2:22pm when workers "hit the wall". Let Energy Booster help you crash through that wall, and come out the other side with an "I am ready for anything" feeling. Before You Workout: Want to get in shape but having trouble getting motivated? Do you hear yourself saying: "I’m too tired to go the gym"? Or when you get there, do you have trouble maximizing your workout? Well, just take one Energy Booster and you’ll have all the energy you need to get off that couch, keep focused, and push yourself to your limit. During Sports: With Energy Booster, you’ll get in the zone and stay there longer, and feel that extra rush of energy to power you through. When Traveling: Maybe it's a lack of sleep because you're anxious about your trip, the stress of traveling, or a break in your routine, anyone who travels knows how tiring it can be. Whether it's a short day trip, a long drive, or a 2-week holiday, Energy Booster can travel along keeping you alert, focused, and energized whatever your destination may be. On Weekends: Are your weekends jam-packed with appointments, long to-do lists, and family events? Does it make you tired just thinking about all you have to do? Just take Energy Booster with you when you're "out and about" and get a boost of energy whenever you need it. Before Going Out: Feeling a little tired at the end of the day. Need that extra boost to stay up late and have a good time. Energy Booster will rejuvenate you and restore your "party attitude". In addition to keeping you up, it will make you feel energized, and ready to dance the night away. 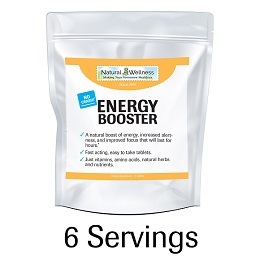 The ingredients in Energy Booster include vitamins, amino acids, and common everyday herbs. Vitamin B2, or riboflavin, is essential for making two coenzymes (flavin adenine dinucleotide and flavin mononucleotide) that are needed for some proteins in your body to perform their functions and to metabolize carbohydrates, fats, and protein into energy. Vitamin B3 (as Niacinamide) – Also known as niacin, Vitamin B3 is needed to convert fats, proteins, carbohydrates, and starches into usable energy. In addition, niacin searches out and destroys free radicals to prevent damage to your mitochondria. Vitamin B5 (as d-Ca pantothenate) – Helps a large number of enzymes function as well as enables your body to digest and utilize more of the food you eat, turning it into energy. 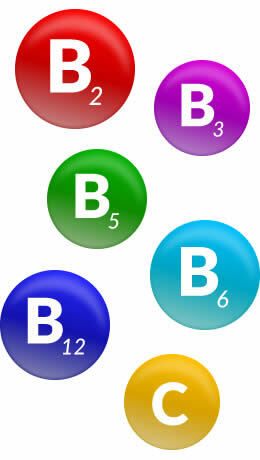 Vitamin B5 also helps the body utilize other vitamins, particularly Vitamin B2. Vitamin B6 (as pyridoxine HCl) – Essential in the mitochondria when the body breaks down stored glucose into energy. It positively affects your eating and digestion, and plays a role in the creation of antibodies to keep your immune system strong. Vitamin B12 (as cyanocobalamin) – Necessary for the normal formation of red blood cells, which are essential for delivering oxygen to your entire body. Without adequate supplies of oxygen, fatigue is certain. 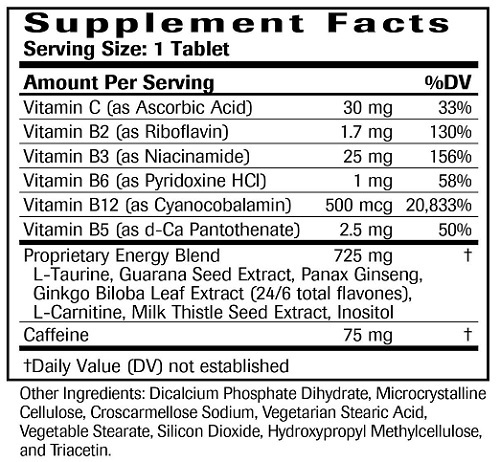 In addition, Vitamin B12 is involved in the production of amino acids and the processing of carbohydrates into energy. Vitamin C (as ascorbic acid) – A primary antioxidant that protects cells from damage and boosts immune system function. L-Taurine – An amino acid that is present in the body, L-Taurine aids in digestion and is used to reduce fatigue as well as enhance endurance by increasing energy metabolism in your muscles. Guarana – A caffeine-rich, climbing plant native to the Amazon rain forest, guarana helps raise your metabolic rate, increase your athletic performance, and reduce your mental and physical fatigue. Caffeine – Increases your metabolic rate, makes you more alert and provides you with a boost of energy. Panax Ginseng – Used medicinally for over 7,000 years, ginseng is the most prized Chinese herb. Besides its long, better known history of increasing mental and physical alertness, it also strengthens your immune system and optimizes your metabolic efficiency. L-Carnitine – A naturally occurring amino acid that aids in the metabolism of fat. By transporting fatty acids into the mitochondria, L-Carnitine boosts energy by stimulating the body's burning of triglycerides as fuel. In addition to its involvement in energy metabolism, L-Carnitine also provides mitochondrial protection. Ginkgo Biloba – In addition to being a potent antioxidant that protects cells from damage, ginkgo is the most commonly digested herb to increase blood flow to the brain. This function not only supports cognition and memory retention, but it also boosts brain energy levels. Inositol – A simple carbohydrate, inositol helps keep fats from collecting in your liver, is efficient in converting nutrients into energy and preserving healthy cell metabolism by maintaining the integrity of cell membranes. 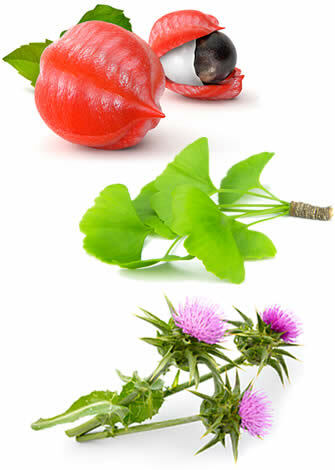 Milk Thistle – The #1 recommended and utilized herb for liver health. When your liver is not functioning well, the first problem most people experience is fatigue. This is because the liver is crucial for digestion, making and storing glucose, and energy production and distribution throughout your body. 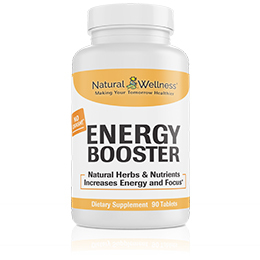 Energy Booster will energize your waking hours by increasing concentration, performance and alertness. Anyone needing that extra punch of energy will feel the difference between Energy Booster and any other energy product out there. Product worked as described. The product provides a steady energy without the major drop. I have chronic fatigue as a condition of fibromyalgia. Taking this has helped to boost my energy levels so that I can get things done, without making me feel overly energetic. I will definitely be a repeat customer. Best Energy Supplement I've ever had!! Just seems to lift the fog without becoming jittery or experiencing an upset stomach. Kept me alert after work to do what I need to do when I get home. I love love love. Helps me when I work 12 hr shifts. No crash Aand if I take before 2 pm does not keep me awake. Gave this a second try after speaking to the companys customer service. Taking this as directed is the key. Not a crazy energy, make your ears ring supplement. One in the Morning and one about 2pm . For me, taking one after 4 pm keeps me up a little. A nice boost without drinking coffee and that crash. It does have some caffeine . I just ordered another bottle... Terific Customer Service Thanks! Works as described for me. I take one in the morning and another mid-day when I am feeling a bit tired. I'm not jittery, I just want to move! I feel like I don't even need my afternoon nap anymore, and I am able to focus on other things. Best energy supplement on the market!!! The dreaded "afternoon slump" has been hitting me like a brick wall lately. And since I'm not a coffee drinker and I can't stand the super sweet taste of sugary energy drinks, I've been looking for something to give me some extra energy in the afternoon. I've been taking this product for the last few days and it has been working great! I take 1 pill whenever I start to feel the slump coming on, and in about 20 minutes, I notice that I'm more easily able to concentrate and get through the rest of my workday without yawning! I also teach fitness classes after work and this product helps me get through my classes with the energy I need! What's great is that I haven't felt that icky crash that you typically get from energy pills or caffeine drinks. For me the best part is - no sugar or unnecessary calories like an energy drink! I purchased this product so I could give up afternoon coffee. I hit that 3 o'clock slump and ugghh...just exhausted. So far, I have taken this 3 times this week and it really works. For me, it kicks in in about 20-30 mins after taking, and I just feel great! It lasts for a good few hours. So by the time my work day ends at 5pm, I still have more energy to tackle at home tasks (homework, laundry, vacuuming, etc) without feeling run down. I have recommended to a few people and do want to let others know - there are no jitters or that edgy feeling too much caffeine can give you. Also, another point I want to mention, I have had no issues falling asleep at night (I take the product @ 3pm if needed). Great boost for those of us that work full time and have family dinner, homework and baths to handle at night. Suggested Use: Take 1 tablet. 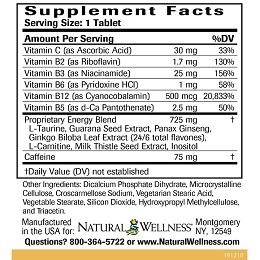 Take additional tablets as needed depending on desired energy level. Do not take more than 3 tablets in one dose. 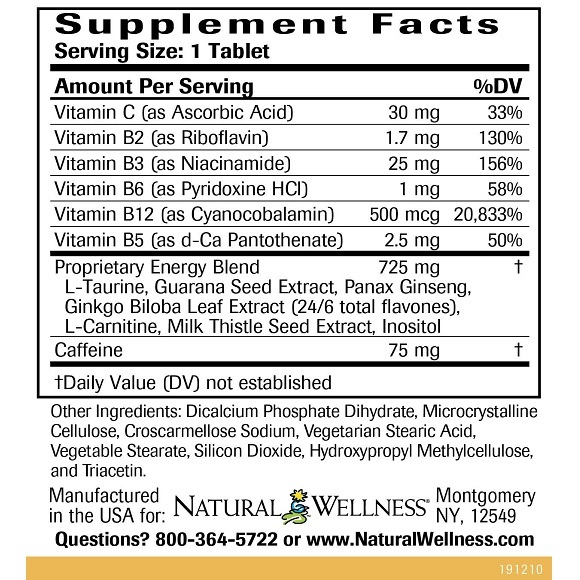 Do not exceed 6 tablets per 24-hour period. 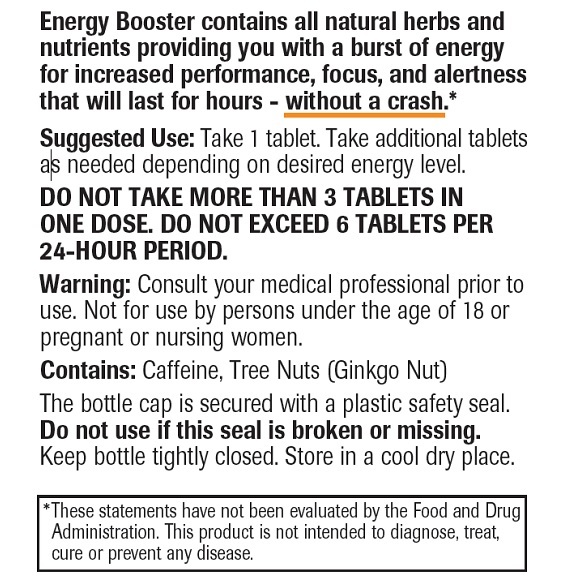 This product contains caffeine and tree nuts (ginkgo nut). Do not take with high blood pressure, heart disease or any other type of cardiovascular disorder. Check with your physician if you have health conditions or are taking medication for the heart or blood thinning medications. Vitamin B-6 may cause harmless bright yellow coloration of urine. Please consult with a health care professional before taking this or any supplement or if you have or suspect you might have a medical condition, or are currently taking prescription drugs. Not for use by persons under the age of 18 or pregnant or nursing women. 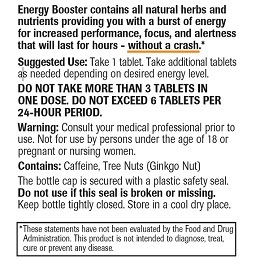 Energy Booster is MANUFACTURED in the USA to meet FDA strict current Good Manufacturing Practice regulations (cGMP).